We LOVE stainless steel bottles for our kids! But not ALL stainless steel bottles are the same. We think we have found the best one on the market from KidBasix. We received a Safe Sporter for review and LOVED it! The Safe Sporter is stainless steel and is BPA free (which we LOVE). It also has grip on the middle and bottom of the bottle. 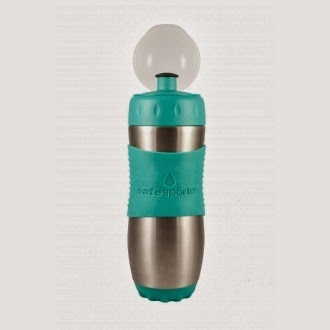 If you have EVER traveled with stainless steel bottles, you know how important that is! The sleeve also provides insulation-- keeping your drink cool! What I love the MOST is that they are DISHWASHER SAFE!!!! And for only $16.99 each on Amazon, it is a fantastic value! You can also fill the bottle with ice and store it in your lunchbox as an ice pack!